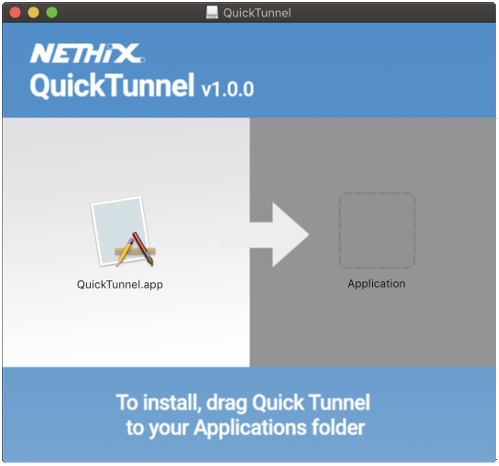 QuickTunnel is a Nethix Software that offers a very simple, intuitive and user friendly interface for accessing the VPN service and managing the devices for the remote access. For operating QuickTunnel only an Internet connection is required. This manual describes the functions implemented on the SW version 1.0.0, released on November 2018. 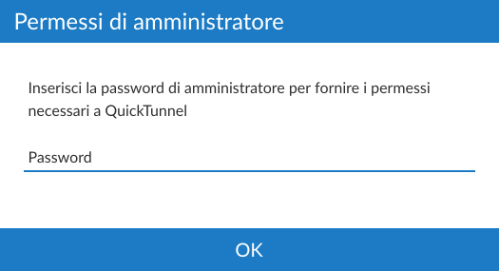 Start up the QuickTunnel as administrator. Start up QuickTunnel and digit the administrator password, when required. 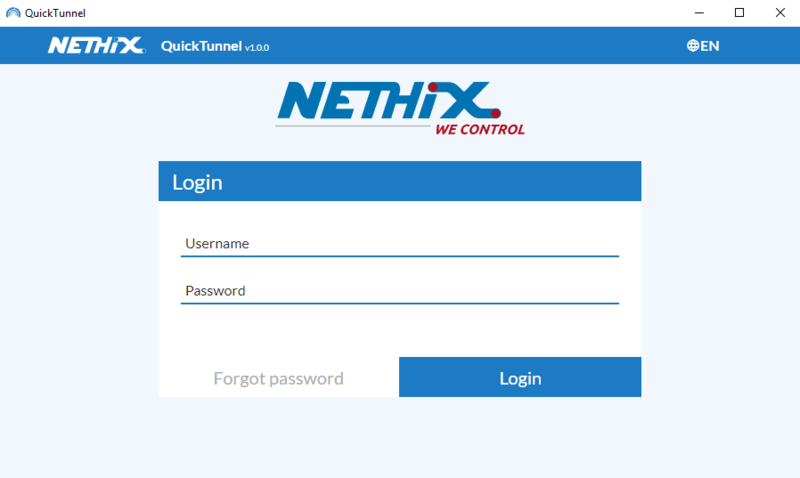 Before using the software QuickTunnel, it’s necessary to have Nethix Portal’s credentials (see Nethix Portal), to insert on the login page. 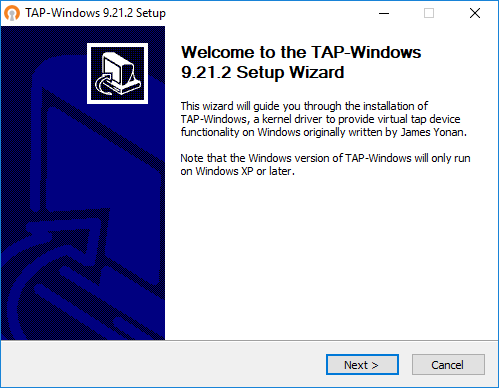 Once entered the credentials, QuickTunnel will start up the VPN connection associated to its account, without requiring any additional procedure. After the login, all available domains and relevant associated devices will be displayed. 1 It’s the name of the user, that made the login. 2 It’s the tab for the language selection. 3 It’s the Button to log out, to end the session or to change the user. 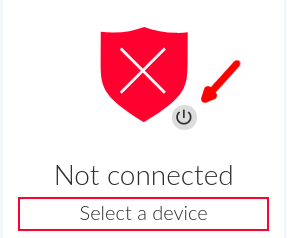 4 Once a device has been selected from the list, in this area will appear a green icon (if the connection has been successful) or a red icon ( in case of communication problems). The name of the device and the traffic data of current connection will be displayed. 5 Name of domain. Every domain can include several devices and build up a VPN network, that is not visible to other domains. 6 This icon allows to hide/show the devices inside the domain. 8 Clicking on the icon, if this can be selected, a connection will be established between the device and the PC. 9 Once established the connection with a device, it’s possible to click this tab to enter directly the Web interface of the connected device. The predefined browser of the user will be opened. 10 If this button is shown beside the device, it’s possible to click it, to enter the configuration page of the serial ports (see Serial Port). 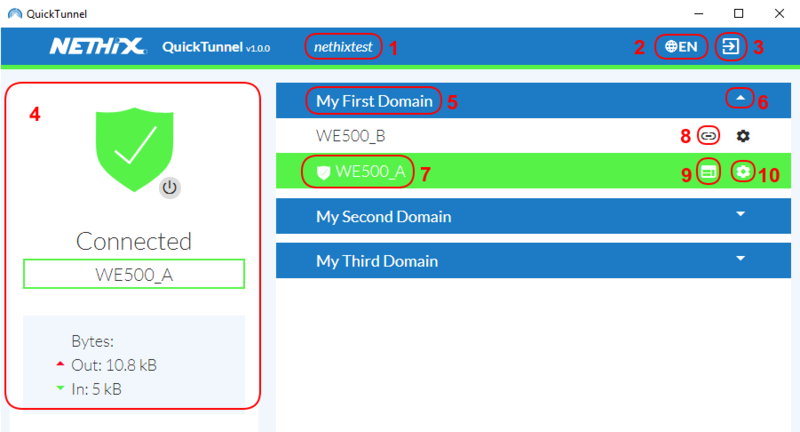 QuickTunnel allows to establish a VPN connection with the domains managed by a user, without any additional configurations or procedures. 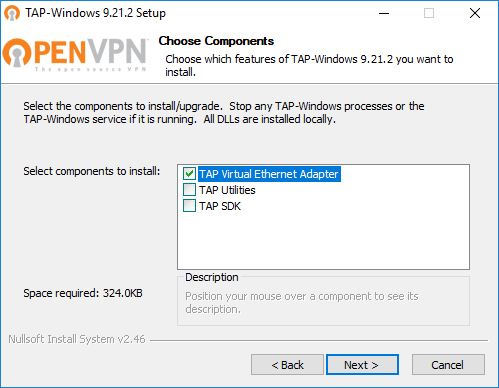 At the start up, the software tries to establish a connection with the last selected device, thus building up a transparent VPN network in the PC. Once established the connection to a device, all devices associated with the same domain, will be accessible by entering their addresses on a browser or clicking the relevant icon, positioned near their name. In order to connect to a device of a different domain, it’s enough to select it from the list. 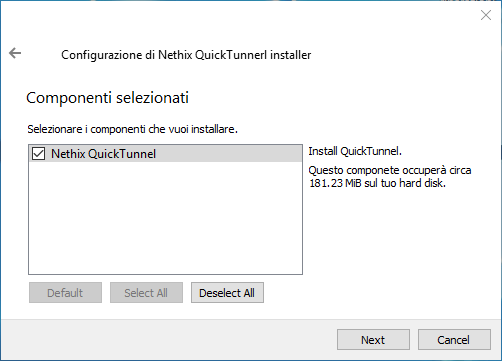 Thus QuickTunnel will remove from the PC the previously created VPN connection and establish a new one, allowing the user to communicate with devices included on the new connection. For terminating the VPN connection, it’s enough to click on Disconnect, as shown on the picture above, or close the program. QuickTunnel allows an easy configuration of the virtual ports, used by the PC to communicate with the devices connected to the serials of the WE200/WE500. Clicking on the icon, shown on the picture below, a new page is entered, where the virtual serial ports, currently associated to the device, are displayed. Here is also possible to add new serial ports as well. It’s possible to add a new virtual serial port just by clicking on the icon shown on the following picture. available on the field Type. Once selected the desired port, click on Create in order to proceed. A new virtual serial port is then created on the PC. This port will be displayed on the list of the available ports, as shown below. From now on, all traffic generated on the PC virtual serial port, will be sent ( regardless of the used communication protocol) to the device connected to the physical serial port of the selected WE500/WE200, and vice versa. Remind that QuickTunnel prepares the PC for the communication with the selected WE500/WE200 device, but for a proper functioning it’s necessary to configure the Remote Access function on the latter (WE200 Remote Access and WE500 Remote Access). At the termination of the software QuickTunnel, the VPN connection will be disconnected and the created virtual ports deleted. At the restart of the software, both the VPN connection and the serial ports will be re-established automatically. Quick Tunnel is available only for 64 bit systems.